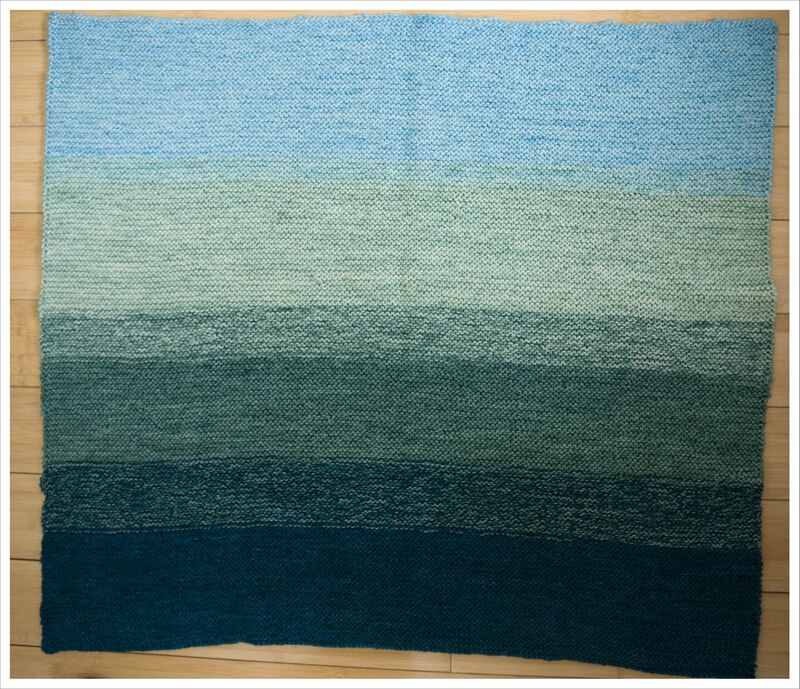 Back in May when I rounded off my US trip in New York I bought this fantastic wool at Purl Soho. I decided to knit a baby blanket for the arrival of my best friends first baby this month. The wool is from Madeline Tosh (first post here) and is an incredible soft Superwash 100 % Merino that comes in the most delicious colours. My friend Leigh, like me, isn't afraid of colour so I thought I choose a variety of turquoise/green and blend them one into the other while knitting. I wanted to make something gender neutral as I don't really believe in the the girl/boy colour division but also because Leigh and Drew didn't want to know the baby's gender until birth. Leigh is incidentally also the person who found the name for my blog but since hasn't really bothered visiting the blog much (grrrhhhhh.....), she is a busy bird and will be even busier now I guess. The baby blanket was indeed finished some two weeks ago but the baby only arrived this week. 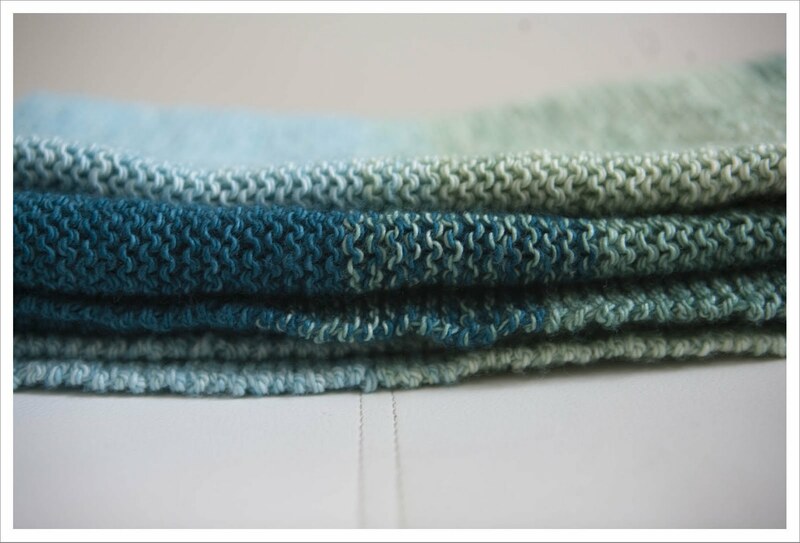 So here is my "Oceanside' baby blanket for Anya Louise who I will meet next weekend for the first time. I can hardly wait. 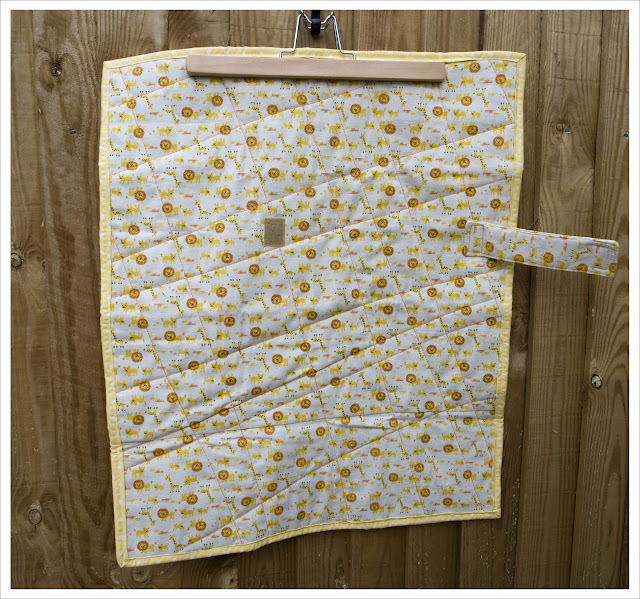 But I kinda thought I can't rock up there without anything quilted so I made a little something that I am actually really proud of and most probably will produce a lot more of in the future for the on-line shop as I think they are so, so practical. I made a mini quilt that combines as a handy changing mat or baby quilt for all occasion. 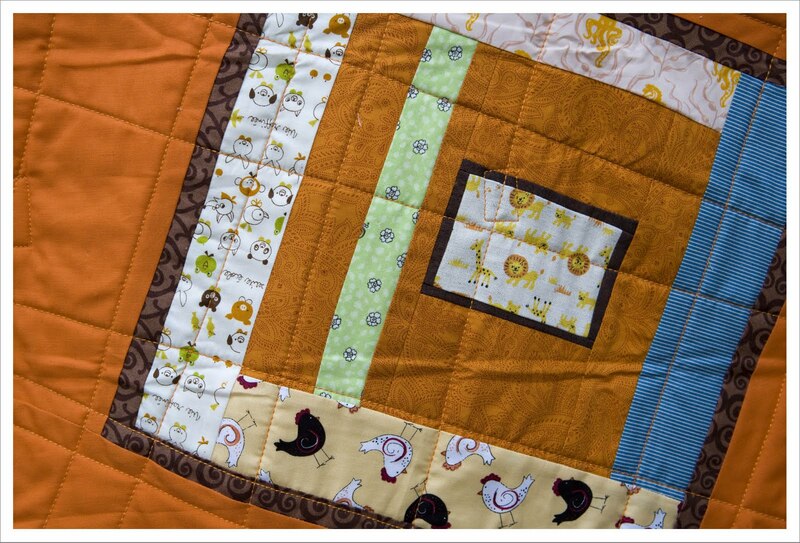 Perhaps I should call it the 'all-occasion-baby-quilt'. I used fabric from my stash and a block I made ages ago but didn't really like. I took the block and boldly cut the pieces off I disliked (God that was liberating !) and added new strips to a kind of wonky log cabin until I was happy. Then I embedded the whole thing into some bride summery orange. I have a rather large amount of Kokka cotton/linen meter pieces in my stash I bought last year at Eternal Maker at the Birmingham Quiltshow but so far haven't really done much with them. I always felt they were to precious but when I was looking through my stash for something appropiate for a quilt back I thought these were ideal because they are little sturdier due to their linen/cotton combination. And that is what I want for a small quilt that should be thrown about and used for anything and everything. The binding is a yellow Polka dot also from my stash. 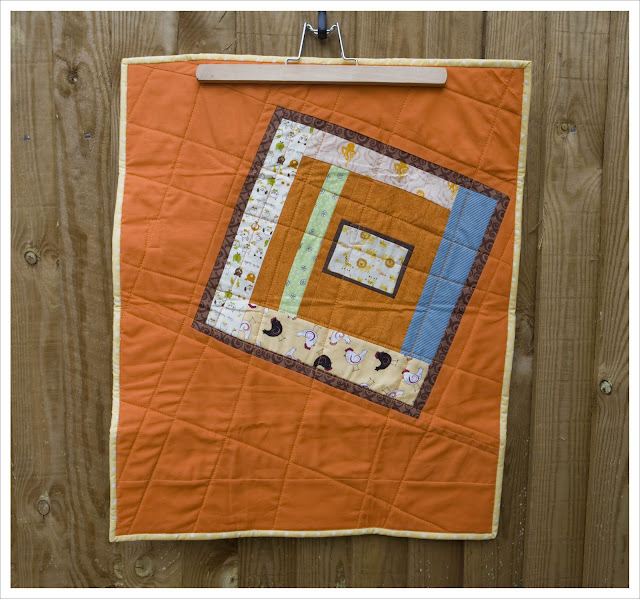 The quilt is approximately 22 x 20 inches and I was originally inspired by these quilts here from Fresh Lemons quilt. 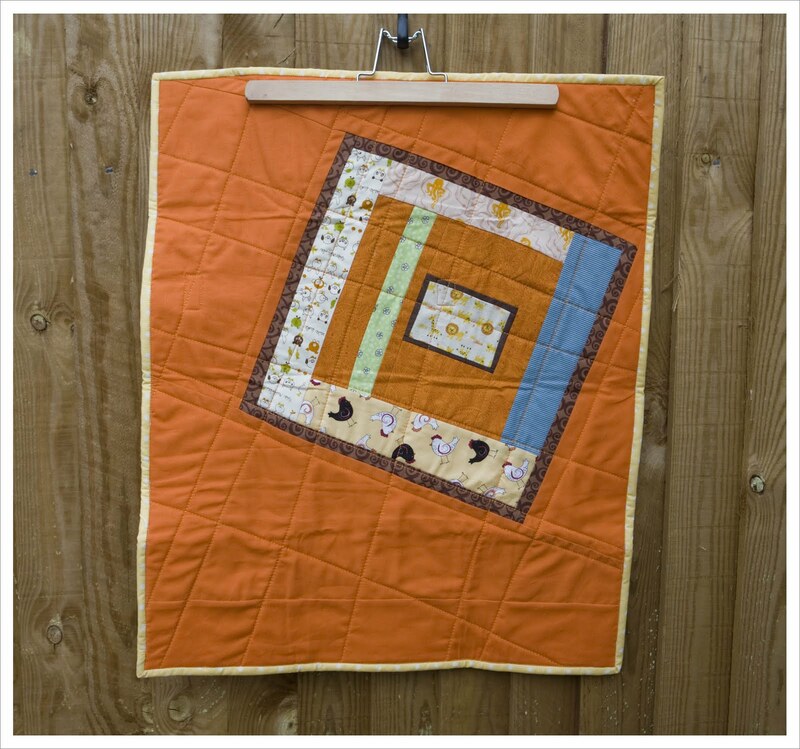 I quilted it in random straight lines with a wonderful Perle Orange thread. I did this on the machine and was surprise that my Janome took it without to much moaning as it is a rather thicker thread compared to my usual Gueterman Sulky 30. 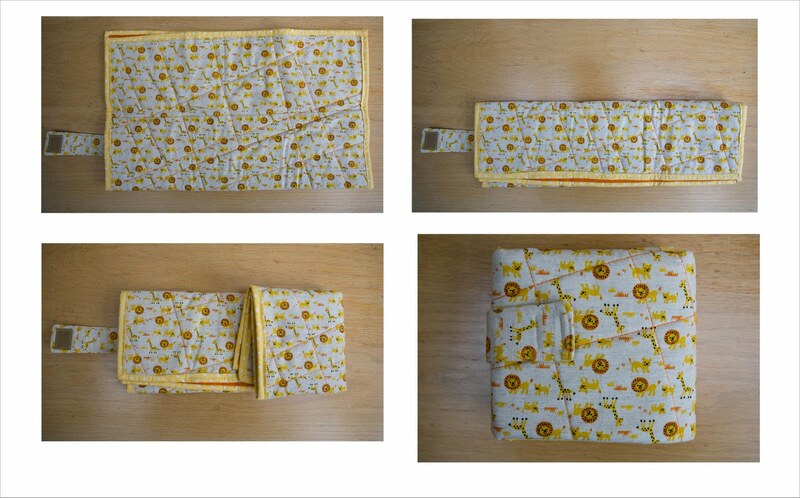 As you can see from the Image of the quilt back I added a closing strip with Velcro to the quilt so it can be folded up small to become a portable changing mat or indeed a quilt-for-all-occasions. With this composite below I try to demonstrate how to fold it up. Pretty neat don't you think ? 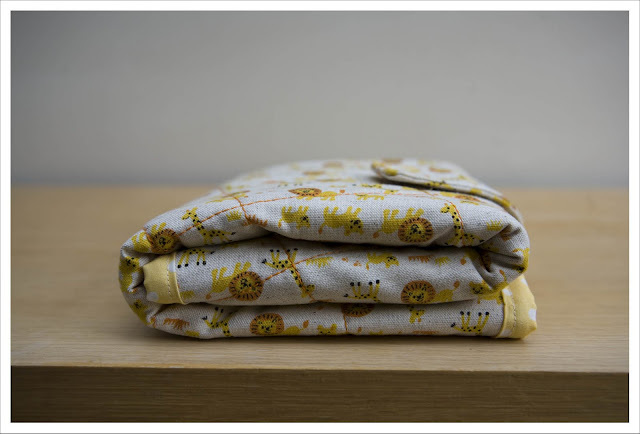 i honestly think i'm going to make a fold up baby all around usable changing quilt! 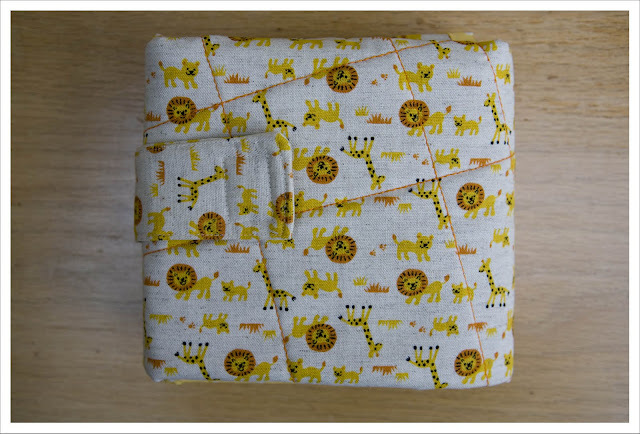 my mom asked me if i'd make some baby gifts for her and that looks so easy and fun to make! great idea. Judith what a brilliant post! The blanket is just lovely, the colours are so beautiful, and as Hadley said, that all-occasions is genius! Lovely lovely, both the blanket and the quilt! I would be uber chuffed to receive either, well done you! Gorgeous colors in your knitted blanket! Lovely work.